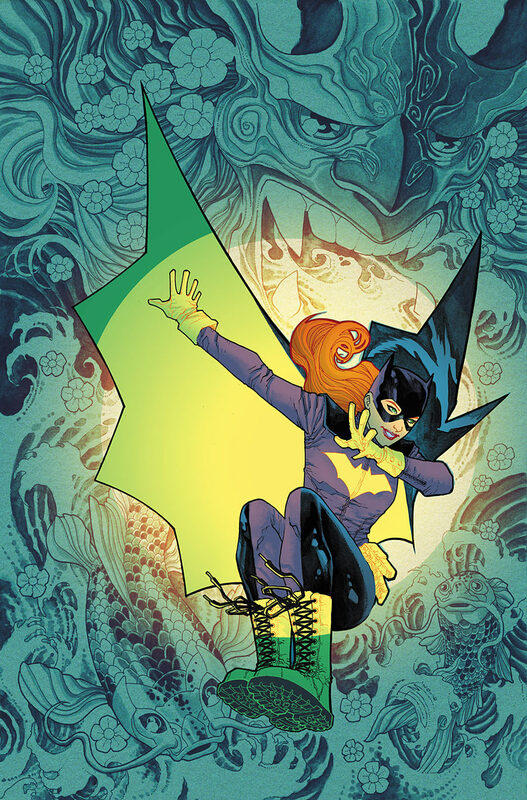 Batgirl is leaving Burnside behind her and leaping into a brand new era! With a new title and a new series direction, Barbara Gordon has the spotlight firmly planted on her in this fantastic variant cover by Francis Manapul. Manapul hints to the new series direction, showing Japanese imagery in the background, masterfully bathed in a blue ink wash, as Babs prepares to explore the vast reaches of Asia. She herself is happy for this new journey, and with her cape outstretched shows off classic Bat-family style. It’s a great look for what’s sure to be a great new series! The mutant menace. They live among us. They could be anybody. Kevin Wada shows off Mystique in his slick Death of X variant. 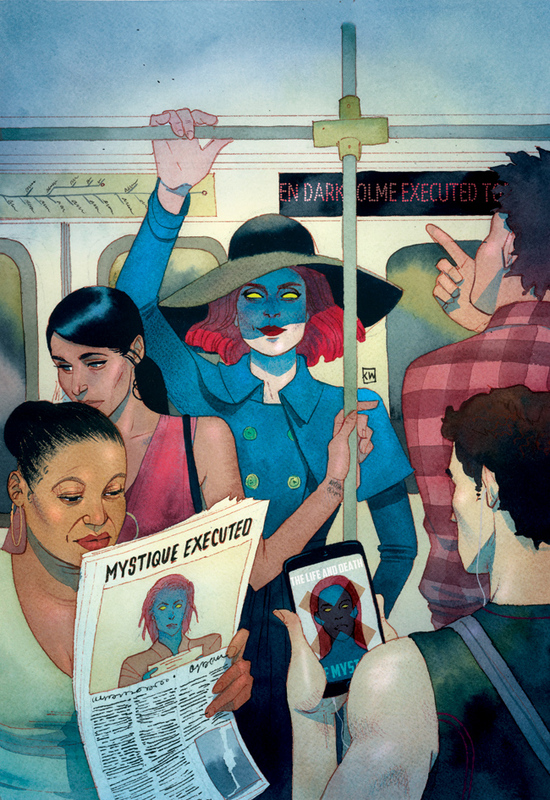 Mystique uses her mutant power of shapeshifting to effortlessly blend into a crowded Subway train. Wada is able to subtly tell an entire story in a single image, with newspapers and smartphones proclaiming the mischievous mutant mastermind’s untimely downfall. But with a clever use of shadow and his always amazing sense of fashion, Wada reveals that the woman staring us down is the very much still alive Raven Darkholme. A sly smile and a raised chin empower Mystique, who proves to be every elusive, and always intriguing. Guardians of the Galaxy is an instant pop culture classic. Filled with quirky characters and a phenomenal soundtrack, it’s honestly impossible not to fall in love with the cosmic squad. Mike Del Mundo’s beautiful homage to the climactic dance off is perfectly in tone with the movie itself. It’s a completely serious look at a man who is completely not serious. 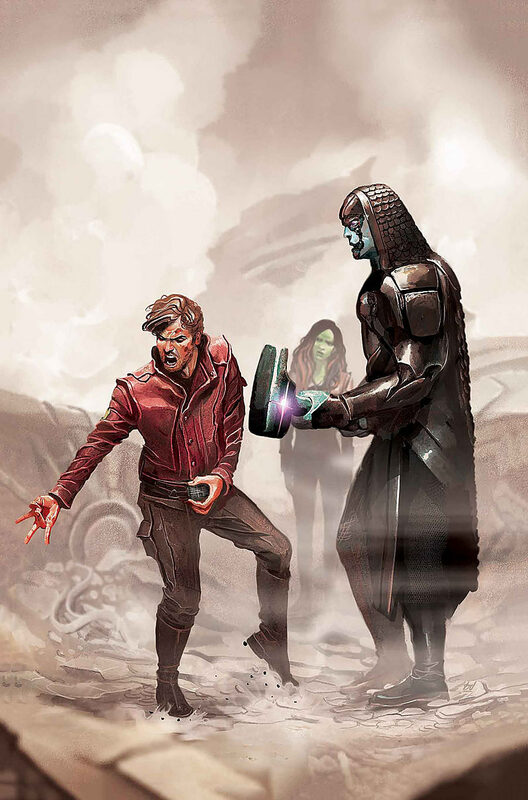 Del Mundo pays attention to the little details, like the dust being kicked up by Star-Lords grooving and Gamora’s complete confusion at the whole ordeal. It’s a wonderful tribute to a movie time will never forget. Alas, thus ends of the tale of Harley Quinn. With a relaunch approaching, Amanda Conner sends our hero into the sunset, gracing us with an understated and memorable cover. 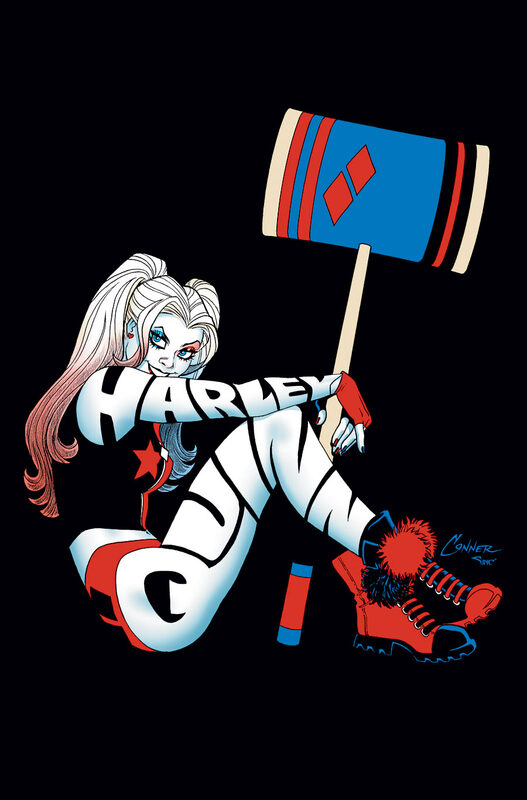 It’s extremely rare to see the title of a series play a part in the design of the cover, but Conner does so by making Harley’s body made up by her name. Conner draws the character so well and is able to get across so much personality through posture and costume design. Playful and yet illusive, Harley dares the reader to approach her, to challenge her. It’s a quiet end to a very loud series that is revving up for more! 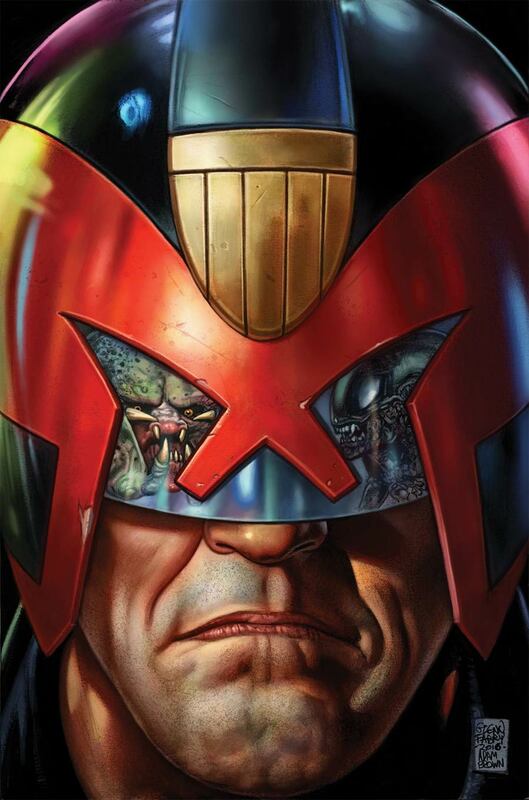 Judge Dredd is the man’s man. With a chiseled physique and a scowling face, he can take down any punk that crosses his sights. But can he stop both an Alien and a Predator? That’s the question behind the latest Dark Horse crossover, which pits the trio in each other’s crosshairs. The iconic visor of Dredd reflects the equally iconic snarls of the Xenomorph and the Predator, as readers place bets on who will win! Glenn Fabry makes the cover look like a classic action movie poster and features in depth shading and detailing. The five o’clock shadow Dredd is sporting oozes machismo, and the series guarantees to be a slugfest unlike anything seen before!